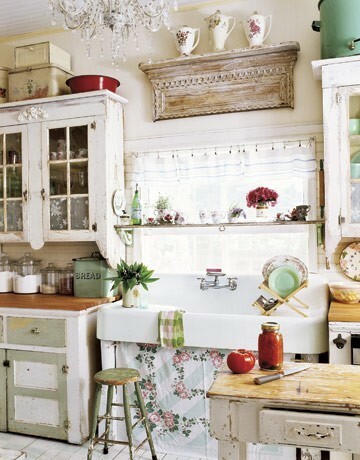 The kitchen is the heart of the home and is a perfect room to decorate in a shabby chic style. With the relaxed and distressed furnishings, typical of shabby chic, the style offers lots of down home comfort for gathering with friends and family. My own kitchen is more on the traditional side but I have incorporated lots of vintage accessories and even this old shabby sign to give it some of that shabby chic comfort. My next kitchen will probably be much more shabby and I had fun searching for my favorite decorating ideas! I hope you enjoy this collection too. I love everything about this kitchen area from Coastal Living. The weathered wood table looks just right paired with the white chair and bench. Of course the feminine pink chandelier and French inspired pillow adds the perfect amount of chic with the shabbiness. This kitchen island is looking totally relaxed in it’s distressed decor. 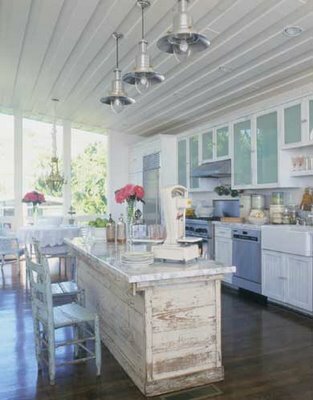 I love the beachy feel of this kitchen with the wood ceiling and fun pendant lights as well. The lighting is what really stands out in this shabby chic kitchen by Practical Decorating. The dark rustic look contrasts so well with the light and airy feel of the furnishings and the rest of the interior. There are so many cool things to take notice of in this kitchen! First of all, the shabby wooden shelf holding the antique pitchers is to die for! All of the detailing blends together perfectly – the chic chandelier, the farmers sink, the shabby butchers block table and green stool, the beautiful cabinets and all of the great vintage accessories make this an ultimate shabby chic kitchen. 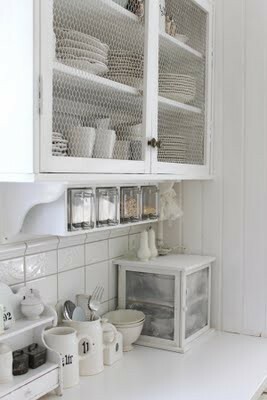 A common theme of most shabby chic kitchens is all of the white decor. Here is an example of using all white on white. The crisp clean look is anything but sterile when combined with the nostalgia of vintage accessories and old wood cabinets. Basically, the key elements to think about when decorating for a shabby chic kitchen are to use old wood, vintage accessories, white, and some chic lighting like a glitzy chandelier. A fun craft idea that you may want to try is my chicken wire basket that I use to store lemons on the kitchen counter.